The Herts Closed 2016 was a great success again, with increased number of entries from last year. Large number of entries in the Mens B and C competition making for some great battles on court. Last year there were only 7 entries in the C competition, this year there were 20! We also saw an increase in junior players entering the tournament, due to the date not clashing with a Junior Silver event for the first time in many years. It was a breath of fresh air to see the emerging talent from our juniors in Hertfordshire, Haasnat and Zan Farooqi, Adam and Joshua Ben, Jamie Gall, David Bennett, Nyah Williams. First matches on Sunday were the semi finals of the Mens B and Mens C Competitions. In the Men’s C, Thomas Horton beat Oli Howes 3-0 to reach his second final in a row, could he retain his title? In the other semi final Tom Elliott came through in a closely contended match just beating Nick Henderson 3-1 10/15 15/10 15/11 16/14 setting up the final for later in the day. In the Men’s B competition first semi final was Alex O’Sullivan against the No.1 seed and winner for the last two years, Dan Ludlam. Alex was on a high from a great quarter final win against Mark Le Conte the previous day and continued his winning streak by beating Dan 3-0. In the other semi final Paul Cousins beat Owen Ledger 3-0 to set up the final against Alex. Onto the finals and first on court was the Men’s O55 between Paul Drakes and Julian Craxton, No.2 seed. No.1 seed David Wells having withdrawn from the competition due to injury, but Paul taking up the mantle and hoping to cause an upset. Julian however was too strong for Paul beating him 15/6 15/6 15/6. Next was the Men’s O45 Final, No.1 seed Eamonn Price having withdrawn from the competiton due to injury and leaving Mark Blake to take on No.2 Peter Newman. In a strongly contested final, Peter came out the winner beating Mark 3-0, 15/12 15/9 15/10. The Plate Final was between Haasnat Farooqi, certainly a junior to watch out for in the future, and Tom Lo, both who lost in the first round of the Men’s A competiton. A wonderful display of squash from both players, with Haasnat winning 3-0 11/4 11/3 11/8. In the Ladies O40, due to the small number of entries, this was played on a round robin basis with Libby Montgomery beating Sheila Blake 3-1 and Isobel Smith 3-1 to win the title. Isobel Smith beat Sheila Blake 3-2 to take runner up position. Next on court was the Men’s C Final between Thomas Horton last year’s winner and Tom Elliott. In another very competitive, close game, Tom Elliott claimed the title winning 3-0 15/11 15/9 15/8. In the Men’s B, could Alex O’Sullivan continue his incredible winning streak and beat Paul Cousins. It wasn’t to be, Paul being too strong in the end, winning the very entertaining match 3-0, 15/8 15/12 15.13. In the Men’s O35, again No.2 seed Eamonn Price withdrawing due to injury, leaving Jim Hilton to battle it out against No.1 Ali Coker. Unfortunately Jim was not allowed to get settled into the game with Ali winning 3-0 11/2 11/4 11/8. In the Ladies Final last year’s winner Cathy Abernethy was taking on talented junior Nyah Williams in the final. In a very entertaining game with some great squash, Nyah 2-1 up and looking like she could take the title. However Cathy had others ideas on her mind and made a great comeback winning the fourth game 15/8 and finally overpowering Nyah in the fifth. Cathy won 3-2 15/10 10/15 15/17 15/8 15/3 retaining her title. The Men’s A this year was contested by Angus Gillams (world No. 67) and Joe Green (World No.112). With a large crowd watching the game they put on an incredible display of controlled, acurate, breathtaking squash. They movement, retrieval and fitness of both players showing how hard they work on their craft. Angus proving just too accurate for Joe winning 11/8 13/11 11/7. The Presentations then took place with Peter Newman, Herts SRA Chairman handing out the trophies. He thanked Isobel for organising the tournament and Radlett Squash Club for hosting the event again. 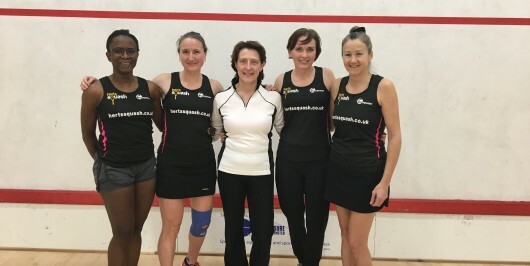 With prize money for all categories this year and top quality t-shirts Herts Squash are hoping to encourage even more players to enter next year’s tournament.